As the previous review notes, this is a wonderful hotel, and they do pick you up and drop you off at the railway station as a part of the room price. The inner courtyard is a beautiful, and all rooms lead off this - on either the ground or upper floor. The Chinese Breakfast is really good, and the hotel staff very friendly and have a machine for English/Chinese interpretation (it possibly does other languages as well. The hotel is in a quiet street and only a few hundred metres from the main streets. I would highly recommend staying here! The price you found is 11% lower than this hotel's average rate of $37/night. Also known as Long Men Boutique Hotel and Dragon Gate Guesthouse, but whichever name u use, it deserves more than 5 stars! Stayed there this week for 2 nights, after we were collected from the train station by their driver without charge. 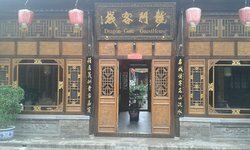 The hotel is so 'ancient Chinese' in appearance but with nearly all mod cons including aircon, wifi & plenty of hot water. Each time we left the hotel to tour we were given a bottle of water, and an umbrella if rain was expected. The rooms are comfortable, beds built into the wall, with a stool to climb in & staff that go out of their way to be helpful. It was unfortunate that the town electricity supply failed for 2 days during our stay, but it did help the authenticity & the hotel generator ensured most creature comforts during that time. The hotel offered a reduction to us because of the power failure but our stay was so good that it was an underserved offer.